The world wide web is a massively useful media in our day to day lives, informing us, empowering us and helping us do things never before thought possible. But as it's so vast, there's also a lot we don't know about it and danger to guard ourselves from. Like we said, it's difficult to know which site is doing what and for which means, so the following list of Internet Browsers’ plug-ins, will help you have more control on the way that you browse the web. One last note before getting to our list. Make sure that you download and install the right security add-ons, sometimes cyber criminals develop alternative malicious apps with the same look and feel of the ones you’re searching for. Much of the personal data (cookies) that websites store on you, is related to advertising. They do this in order to figure out what sort of ads will appeal to you the most (and therefore which ads will promote products that you may actually want to spend money on); but it is uncomfortable for some, knowing that marketers can target them so specifically. Or, they may just find Internet ads annoying. Killing two birds with one stone is AdBlock. AdBlock blocks most advertisements on the web so that you don't have to see them. You'll see white spaces instead, which should also allow for a cleaner reading experience too. What should be noted, however, is that you may see some advertisements due to AdBlock's deals with publishers, with pre-approved ads making it through AdBlock's filters. Also, some sites will not let you read their content if you have AdBlock enabled as ads are very often their main source of income. You can disable AdBlock on as many sites as you'd like, though, which should help you support your favourite publications while keeping the rest of the web (mostly) ad-free. Input form hacks aren't the only way that the Internet can hurt you though, as hackers have also gotten quite good and making the media elements of a web page turn malicious too. Many malicious users utilise things called 'exploit packs' which allow them to leverage vulnerabilities in Java, Adobe Flash, or Silverlight, to install malware on your computer. Given that Flash, Java and the like are found in browser-based games and online videos, it's easy for you to get caught out. Helping to prevent this somewhat is NoScript, a plug-in for Mozilla based Internet browsers that allows you to decide whether or not a website can run its scripts. This way you can whitelist (or blacklist) at your own discretion, with a handy toolbar sitting above your browser to let you know whether you're allowing a site to run scripts or not. When you visit websites like Wikipedia, Twitter or Google via the Google Chrome web browser, you may notice that the bit before the URL turns green, or has a green padlock. While this information may be displayed differently on other browsers, what it means is that these websites are using HTTPS to secure their users' personal data. HTTPS, also known as HTTP Secure, is a protocol for secure communication over a computer network, so you can understand why it's important for sites like Wikipedia, Twitter and Google to use it (Advantio doesn't store user data but we use HTTPS anyways). But many websites do not, and if they store users' personal data, they are potentially putting their users at risk. That's where HTTPS Everywhere comes in. HTTPS uses your browser to establish a private connection between you and the website that you are visiting, meaning that even if the site owner hasn't put HTTPS in place, HTTPS Everywhere can solve the problem and give you a more secure browsing experience. Blur, which was formerly known as DoNotTrackMe, combines several Internet security features into one handy plug-in. Blur offers things such as secure password creation, with its passwords and key data being stored using AES-256 encryption. You can also create encrypted passwords even if you already have a password with that particular website. Furthermore, it even allows you to mask your credit card when purchasing online goods, though if you do want to use your real card, Blur will allow you to enter your details at the click of a button. And, Blur even allows you to block tracking that doesn't come from cookies. Like HTTPS Everywhere, KB SSL Enforcer is designed to make the connection between you and your favourite websites more secure. Many websites use SSL files for their security, with SSL certificates activating a HTTPS protocol, thus allowing a secure connection between your Internet browsers and the web server that provides the information. Again, the problem is that not many sites use SSL certificates, mostly because acquiring one involves achieving many high technical requirements and extra costs. KB SSL Enforcer is a sort of workaround to this problem as it automatically detects if a site supports SSL (or TLS) or not and it forces all of the requests to that site's server to be over SSL, ensuring that no unencrypted requests are delivered. Have you tested other Security add-ons? The plug-ins in this list are not going to protect you from any security risks, but they will help you keeping your personal information a bit more under control. Have you heard of other interesting add-ons? Are you are personally using great ones? 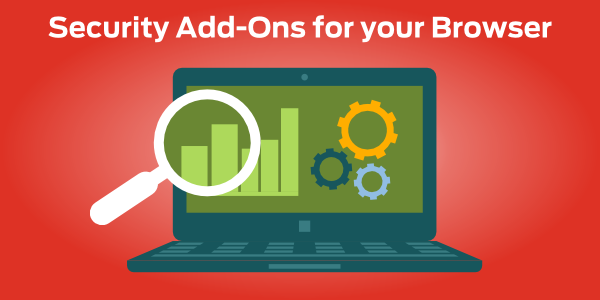 Do you develop add-ons yourself and you would like them to be tested by a security expert? We can give you the chance to write about them, get in touch with us.